The Knob Hill Wind Farm project has obtained an Environmental Assessment Certificate. Congratulations to the folks at Sea Breeze Power Corp. who have shepherded the project this far. Now for the bigger challenges. Find a customer for the power. And find the capital to build it. No customer = no capital. 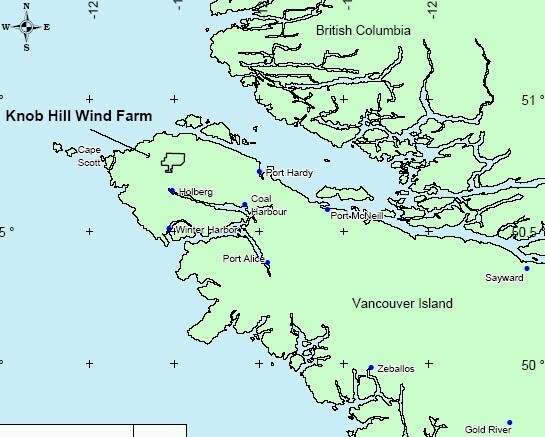 BC Hydro, the obvious customer, has been a consistent impediment to the development of BC’s awesome wind potential. That attitude is unlikely to change, at least with the Neufeld/Campbell mindset that prevails in the provincial government. And with the Call for Tenders (results expected October 9) for power generated on Vancouver Island, BC Hydro probably will have as much on-island power as it intends to purchase, at least until 2007. The EA Certificate is a milestone. But a lot more wind will blow over Knob Hill before any power is generated at the site.